[Brooker / Reid] 'Queens'; pretty much the standard Procol version. This is not a lost song of Brooker / Reid, but it certainly is a rare song, however frequently it's played. [Brooker / Reid] 'Kings' (TR steel-strung acoustic guitar; FM, tenor): first verse just piano and voice. A fine vocal performance throughout, whereas it has sounded quite strained with Procol from time to time, as it's pitched very high. GB points out that Robin Trower set these Reid words first. [Brooker] 'Kings' (TR steel-strung acoustic guitar; FM, tenor): song introduced by GB as a kind of follow-up to The Angler: he was in the tundra trying to prevent a mighty salmon pursuing its ancestral breeding path – 'I felt so ashamed that I was forced to write a song'. [Brooker] 'Kings' (TR electric guitar; FM, alto): not a Brooker/Reid song, since GB has not yet selected Reid words to go with it. Attractive melodic piece with the vocal line taken by TR, FM providing a counterpoint. [Brooker / Reid] 'Queens': this has become a familiar song to the cognoscenti, but it's still something of a lost number and obviously deserves to be recorded. The bridge passage, occurring twice, is less harmonically interesting than it was in last century's arrangement: but it's still a fine song. [Brooker / Reid] 'Queens': the song is back in the Procol repertoire, where it belongs. Nice performance, not any kind of retread of the 1967 recording: much more of a vehicle for soloing, which was well-received. [Brooker / Reid] 'Kings' minus TR; FM alto, Bronzie on electric upright bass, and featuring Dave Ball on his 1958 model Les Paul (Gibson Custom Shop Historic Model Number LPR-8, Serial number 8 7231 for those who need to know these things!). Great R'n'B feel here, the whole piece being a cousin of Hootchie Cootchie Man. Witty, self-deprecating lyric: did I hear 'jazz' rhymed with 'spaz'? Ball on top form and very warmly received by the audience, many of whom had also heard him play with the Palers' Band earlier in the day. [Brooker / Reid] 'Kings' (FM tenor, TR lead, Bronzie bass guitar). Or is it Chasing for the Chop? Splendid song, played with committed, chugging verve (had been heard over and over at soundcheck, incidentally). of two Bristol blue glass trophies for Gary Brooker and Keith Reid, commemorating over forty years of Unique Entertainment. 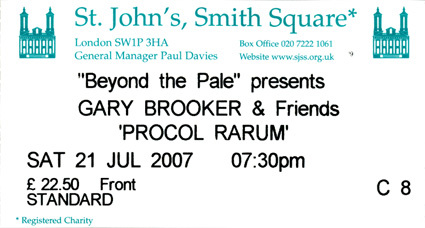 [Brooker / Reid] 'Kings' + 'Queens'; the two bands combine on a protracted work-out version of this 2003 Procol stage number; it works very well for a party-style climax and there was plenty of dancing and singing along. Of all the styles visited in tonight's show, this was the least Procolian, oddly enough. It was such a good ending to the show that the scheduled Shake, Rattle and Roll (which had been extensively rehearsed) would have been entirely redundant. 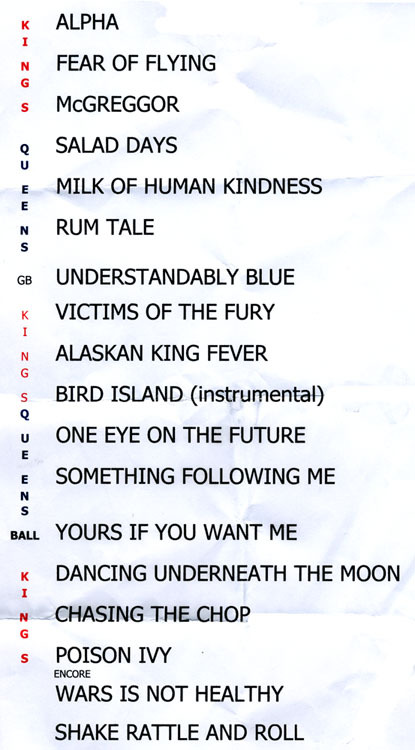 Very good musical guests, and some completely unpredictable song choices, made for an enthralling 'Procol Rarum' concert, judiciously different in tone from the previous evening's Procol Harum show.